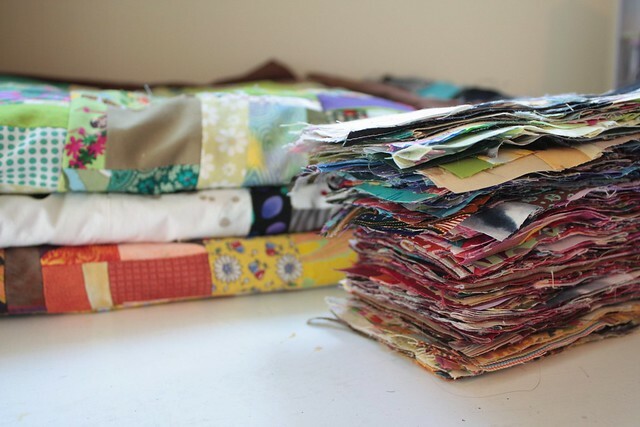 In the previous post I mentioned wanting to make scrap quilts from my bins of leftovers. After several years of this being a back-burner project, I finally had motivation to finish it. Leftovers 1 is done and submitted to IQF’s Beauty in Pieces special exhibit. 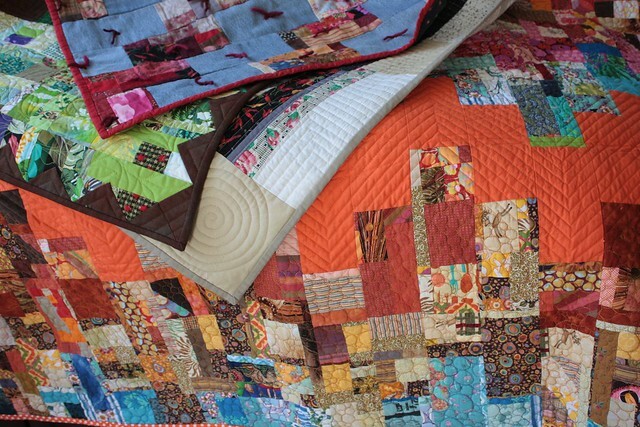 My fingers are crossed that they’ll like this wonky, freeform, take on a scrap quilt. I started by making the quarter log cabin blocks, not exactly sure where I was going with them. I played with setting them on point to make zig zag rows which looked pretty cool, but then I bored of making them. I was distracted by seeing posts of Sherri Lynn Woods’ Get Your Curve On workshops, so I started sewing wedges, happy that they went faster than the log cabins. That’s the point where the pieces told me they wanted to be a medallion and it grew from there with more purpose. I had lots of squares already cut and leftover from making Temporary Safety which came together easily as a checkerboard, and the center of the quilt was set. The mostly checkered border was inspired by my trip to the San Jose Quilt and Textile Museum and seeing Margaret Fabrizio’s Kawandi-inspired work. I still have enough fabric to make another round, and as a bed quilt, it could use it, but I stopped when I reached the maximum size for the exhibit, since I think it’s submission-worthy. I quilted Leftovers 1 on my home machine with wonky leave and scallop motifs mixed with straight-ish lines. It’s quirky, but hopefully that’s it’s charm. 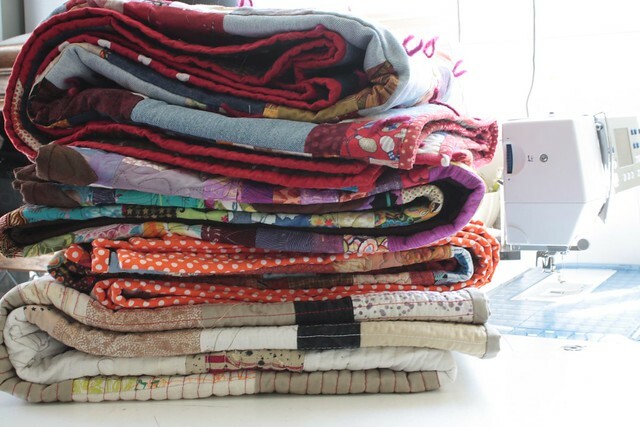 With seven bins of fabric and twelve months, I hope to keep this momentum going and make more medallion style quilts in 2017. 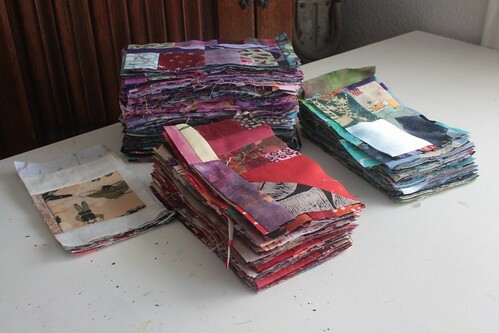 The rules will be to endeavor to use just the fabric in the scrap bins, but if necessary, I can go to my regular stash. New fabric is only allowed for backing. New batting is allowed. For continuity, I’ll create these from the center outward, Medallion-style, but other than that anything goes design-wise. It’s going to be fun! It started here, about four years ago when, inspired by a vintage quilt of my mom’s, I decided to sew all my scraps together into “bricks” and make a quilt. I made progress sewing together more scrap bricks here, and here, in 2012. I finished the first of four quilts made from the scraps in September 2013, and the second in November. The third is somewhere in there too, but since I didn’t blog it, it doesn’t exist. My Scrappy Trips Around the World quilt is done. You may remember it from this post, where I was trying to use up leftovers from my pixelated Selfie portrait, but needed to restrain the colors a bit to keep it from getting too ugly. 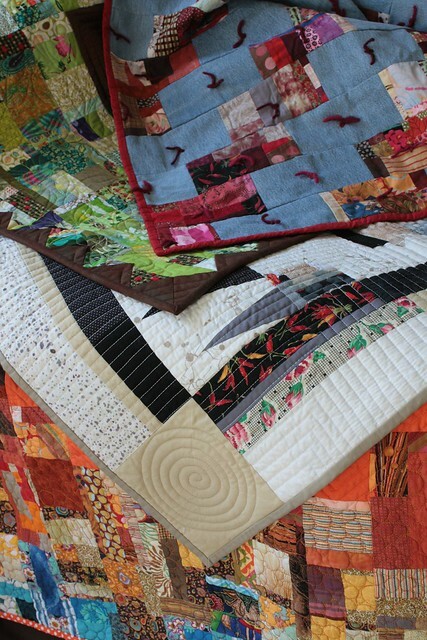 That said, it’s still pretty much a scrap vomit quilt. I do like the insert of the smaller squares here and there! It was supposed to be just blues and oranges (brown counts as dark orange) but I needed one more column, so I allowed purples. As far as I’m concerned it’s a utilitarian bed quilt and I’ll never worry about anything that happens to it. I also used it as my first big long arm quilting practice. I used the pantograph method where I’m moving the machine head to follow a pattern indicated on a screen. I’m actually wobblier trying to follow a line on a screen than I am “drawing” directly on the quilt, but it was good practice and I definitely wasn’t ready to quilt this big a quilt completely freehand. Oh, and yes, I did have the rug above the bed in mind while I was making this quilt — I thought the diamond in the rug pattern and the diamond in Trip Around the World would speak to each other nicely. The back is most of the body print tests I did for “Exposed,” my TSA inspired quilt that is currently in the Privacy in America show. The back is much more sedate, but all those ghostly bodies on the bed kinda freaks me out. It’s been non-stop sight-seeing and beach-bumming here since mid-December. I’ve actually got a bit of a tan now! But, alas, there’s not much actual quilting or art making going on. I took today to work on one of my in-progress pieces though. 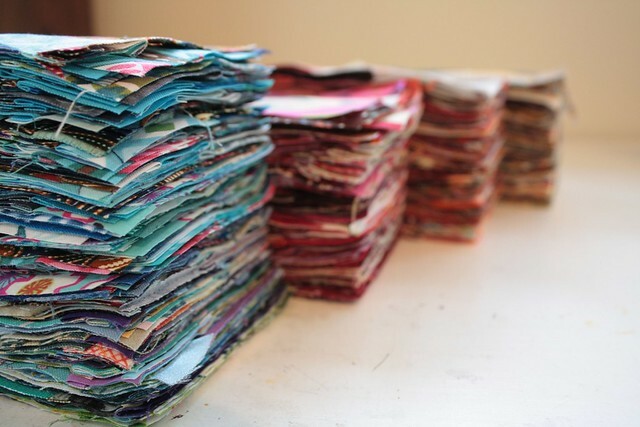 I was on a roll with sewing tiny bits together and my bin of red scraps didn’t look too daunting after using what I needed for the “real” project, so I took a bit of a detour and sewed ALL my red scraps together. I cut brick shapes that will eventually be a sibling to this quilt top which I made from neutral scraps about nine moths ago. The photo above shows today’s work in the center red pile, plus the few neutral bricks left over from the Achromatic quilt top, and purple and blue bricks previously sewn at a Saturday Bee. The crazy thing is that both the blue bin and the black and white bin have refilled with scraps enough to make as many bricks as the red pile! I think they must multiply in the dark. My green and my yellow bins are almost overflowing. I may need to take a big detour soon and whip them into tidy piles of bricks. For now though, the red scrap bin is empty of scraps. Ahhhhhh.